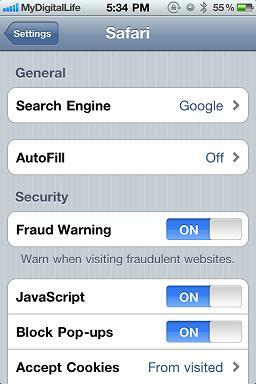 If you are frequently browsing on Safari web browsers on iOS devices such as iPhone, iPod touch or iPad, you may realize that some websites require your authentication in order to continue the web browsing. Even though this is good for security reason, but sometimes it could be annoying especially certain websites that require a long password that you need to type repeatedly on a space constraint soft keyboard. If you are not aware, there is actually a way that you can turn on the user name and password memorization built into the iOS features by following below steps. First, go to Settings -> Safari, then browse to ‘AutoFill’. Under ‘AutoFill’, you will notice that it is currently in Off state by default and further tapping into it will go into next level of settings. 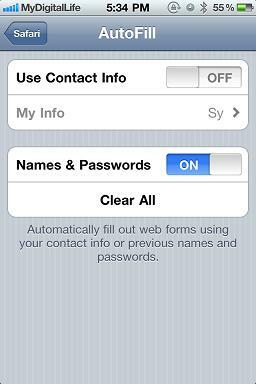 Over here, there are multiple fields that you can enable and go to ‘Names & Passwords’ and toggle it from OFF to ON will enable the auto filling mechanism, which will memorize your previous names and passwords so that users can fill up any web forms automatically when browsing on Safari web browser later. By now, whenever you logon to a new website, there will be a new prompt up that will ask if you want to save the logon’s username and password, and by clicking on ‘Yes’ will save them so that you can automatically logon without the need to retyping again next time when browsing to same page. Hopefully this simple tip will able to help you to do a more effective web browsing on iOS devices’ Safari web browser while moving around.